Recently I had to polish my patent, ruby red Tieks. It’s something I have to do every few months or so to keep the leather nice and shiny. As I sat down at the kitchen table with my polishing cloth and shoe polish, I was suddenly sucked back in time to when I was a little girl. I remember my dad used to polish his leather dress shoes the same way, sitting at the kitchen table with his shoe polish kit. These days, people in the medical field wear comfortable scrubs and sneakers. Back then in the early days at his job at the hospital lab, he used to wear slacks and a lab coat. Polishing his shoes was a weekly ritual. He would apply the shoe polish gingerly to different spots around the shoe. Then using an old fashioned horsehair shoe polishing brush, he would buff the polish out, paying special attention to the toes. I never payed attention closely, but I was usually nearby either sitting at the kitchen table eating my breakfast or on the couch a few feet away watching cartoons. It was a mundane task that my dad periodically engaged in, like cleaning his rifles, so it never really interested me. Little did I know, my young mind was recording every detail: his long strokes, brushing the shoe brush across the leather, the sharp scent of shoe polish. 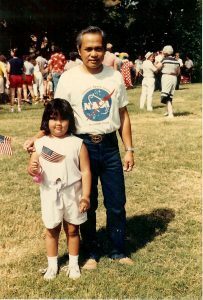 My dad and I at the Founder’s Parade. This was probably 1986 or 1987. When I got older, I would have many more opportunities to make memories like this with my dad. Last weekend I spent several hours assembling a new dresser that we ordered online. It took several hours and a lot of patience, but there was something about the smell of the composite wood and veneer that reminded me of the times I spent assembling furniture with him. I thought of the garage in my parents house, the tool shed filled with all his power tools. I thought of how skilled he was building and assembling things. “Don’t tighten your screws individually when you attach a piece,” he said. He taught me to turn the screws just enough to make sure the piece is on straight. Then you hold it in place while tightening all the screws last, moving from one screw to the other until it’s attached. He also taught me to read the assembly directions. Why? Because he never read them himself. So I often found myself correcting his mistakes because I was the one reading the manual. He was funny like that. Today December 12 marks 5 years since my dad passed away. I think one of the things that’s hard for us to come to terms with when we lose someone dear is that we lose the opportunity to make more memories with them. Our time with them stops and we hope that we garnered enough wisdom from them before they left. But I guess in my case, I can just dream of a life where he’s still alive, advising me on my various home projects and being the helpful dad I know he would have always been.